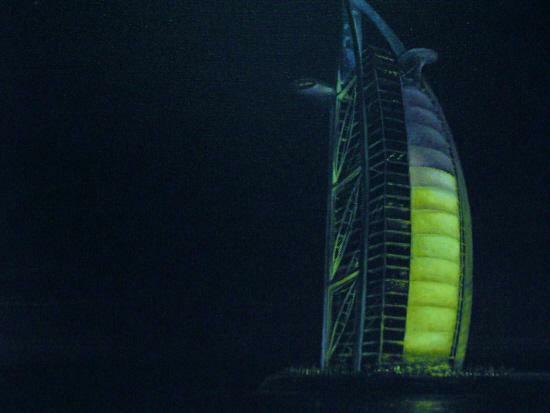 The Burj Al Arab (the name means Tower of the Arabs) “A structure designed to amaze”. It’s the Worlds most luxurious hotel with a unique seven star rating. Standing 321 metres high on a man made island situated 280 metres from the Jumeirah beach in the Arabian Gulf off the coast of Dubai. Its iconic structure was designed as a ships sail billowing in the wind, resembling the sail of a dhow (a type of Arabian boat).Construction began in 1994, Architect and consultants for the project was Atkins, the UK’s largest multidisciplinary consultancy, with a team of British engineers led by architect Tom Wright. The hotel was built by the South African construction contractor Murray & Roberts. It was opened in December 1999, one month before the millennium.